* - Estimated Rounded Off Costs, Subject to change. Does not cover Inflationary Factor into consideration. I am having problem to put revers gear in my Verna 1.6 Ltr 2012 Reg. I am having problem to put revers gear in my Verna 1.6 Ltr 2012 Reg. Any suggestions? Verna Fluidic Diesel 1.6 Ltr::::::: What are the price and brand name of Clutch plate? Just after 55000 KM's ,air conditioner has stopped working.mechanic says coil need to replace .he also told that Hyundai is inserting accessories of poor quality.Every 10000 KM's you need to spend high cost to replace accessories . Clutch plate replaced after 45000 KM's which other cars need to replace after 1.5lac KM's in avg. Now a.c cooling coil need to replace after 55000kms. Worst ever decision to buy this car. Pl think before buy this car. Orelse get ready for unwanted xpenses. Just after 55000 KM's ,air conditioner has stopped working.mechanic says coil need to replace .he also told that Hyundai is inserting accessories of poor quality.Every 10000 KM's you need to spend high cost to replace accessories . Tyre replaced at 35000kms Brake pad after 30000kms Clutch plate replaced after 45000 KM's which other cars need to replace after 1.5lac KM's in avg. Now a.c cooling coil need to replace after 55000kms. Worst ever decision to buy this car. Pl think before buy this car. Orelse get ready for unwanted xpenses. What Would be the actual cost for Complete Steering Assembly of Hyundai Verna Fluidic 2011 (Diesel) ?? thats true the most unfair expense in this vehicle is clutch assembly change in 40000 km . very common for all owners to go through this expenses in 40000 to 50000 kms. and it costs. 26000 including labor charges. Do not buy Hyundai Verna fluidic. Automatic climate control etc excellent. Hey mine is 2011 verna crdi sx(o) bought 2nd hand. Ran 73k. I was confused with engine oil and went with manual guide and chose shell helix diesel 15w40. It seems to be mineral oil. You used helix hx8 that should be full synthetic I guess but not 15w40 grade. Did u research on this? Many suggested not to go with synthetic as I don't know which oil previously used and not a good choice for 73k odo car. 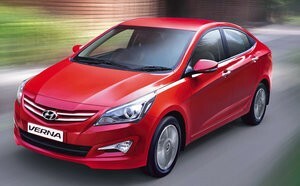 Hi Team - I am currently owning a Fluid Verna Dec 2012 . The car has been running fine just in the last 4-3 months the clutch has been giving some problem . My car has gone for a servicing at a company workshop in Mumbai. The service adviser called and advised for change in clutch plate which would be resulting a cost of INR 40,000/- Saying the actual cost is INR 52,000/- but with discount it is been worked at INR 40,000/-. Does the spare part of Verna cost that expense. For this yearly service I shall be shelling out around 50k inclusive. No Boss., its cost you Around Max 20-25k depends on Showroom Labor Costs. Are brake pads cover in extended warranty?